M T D J a n u a r y 2 0 1 9 62 E u r o p e a n N o t e b o o k A s the January edition of Modern Tire Dealer traditionally con- centrates on industry facts, it seems like an appropriate time to bring readers up-to-date with the latest developments on European tire labelling and also additional approval provisions that cover the installation of tire pressure monitoring systems (TPMS) in new vehicles. It is now just over six years since the European Union (EU) launched new legisla- tion that required all tires in Europe to carry performance information labels regarding their fuel efficiency, wet grip and level of road noise generated. Overall the regulations have worked and all tire producers have delivered tires to their wholesale or retail partners with a label at an acceptable level. Now the EU intends to up its game and increase these regulations by making it mandatory for future tire labels to also include information on snow and ice performance and also for motorists to be actually made aware of tire labels when sold a tire at a retail outlet. is point is very interesting as currently there is no legal requirement for tire fitters to show labels to potential customers at the point of a sale agreement. It is also extremely relevant to note that future labels will also be "future-proofed" so that other amended regulations, when introduced, will add increased useful information including ratings for mileage, wear as well as a potential indication for retreaded tires. These extra changes to tire labelling regulations are expected to be introduced in 2020 if agreed by EU parliamentary ministers in Brussels, Belgium. I have also been made aware of a recent European study commissioned by the European Tyre and Rubber Manufacturers Association (ETRMA) which reveals that currently there are over 78,000 individual labels for car tires alone and the latest EU Market Surveillance project has revealed that 11% of the tires tested were incorrectly labelled. My general opinion on these latest devel- opments for European tire labelling is that it is only right and fair that all motorists buying new tires in Europe should be made fully aware of the label qualities of the product they are purchasing. At the same time, with the winter season being extremely harsh in certain European countries, it is essential that customers when buying tires in particularly "arctic" conditions are made fully aware of what their purchased product is safely capable of. When it comes to the subject of tire pressure monitoring systems, the EU is again looking to broaden the coverage of type approval upgrades concerning the fitment of tire pressure monitoring systems which will soon cover all small commercial and sport utility vehicles (SUVs). ese new vehicle types will now have to be fitted with various safety features including TPMS, intelligent speed assistance, alcohol interlock, driver drowsiness monitoring and emergency stop signals which are part of the new proposed EU regulation. Various leading tire safety organizations in Europe including TyreSafe have stated they wholeheartedly support this innovative new initiative as TPMS has already proven itself as an effective way of reducing tire-related accidents. e new rules will effectively reflect the very latest technical developments taking place to protect and save lives on European roads. It has also been reported that the EU is also continuing to study and implement the further development of technical require- ments for tire noise, rolling resistance and wet grip performance. Looking at the continual developments taking place and asking around in the Euro- pean tire market there is a definite feeling of optimism which has been compounded by these latest announcements on tire labelling and tire pressure monitoring systems. 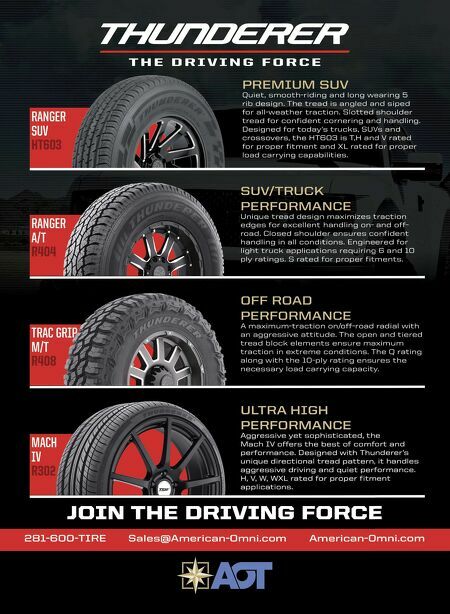 I have also noticed over the past year or so that with regards to tire labels, many manufacturers have been working toward upgrading the ratings of their tires, meaning that having an impressive tire label rating is now regarded as an important part of a new pattern's presentation to the market. Levels of tire safety continue to improve which can only create a positive momentum for the future. ■ John Stone has been working within the global tire industry for the past 28 years. In 2004 he launched his own consulting company, Sapphire Media Service, which caters to business media clients around the globe. Stone also writes for tire and automotive-related publications in Europe, South Africa and Asia. 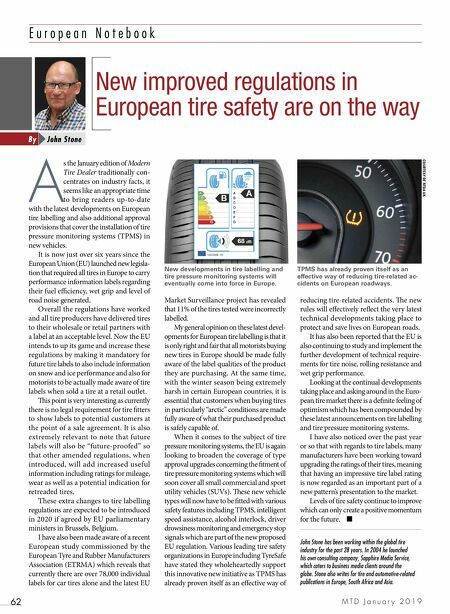 COURTESY OF NTDA UK New improved regulations in European tire safety are on the way John Stone By New developments in tire labelling and tire pressure monitoring systems will eventually come into force in Europe. TPMS has already proven itself as an effective way of reducing tire-related ac- cidents on European roadways.